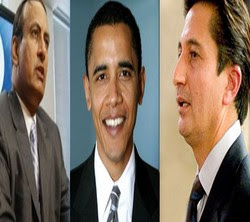 WASHINGTON: President Barack Obama’s anti-terror escalation may not prove enough to break the back of Al-Qaeda and the Taliban, the Pakistani and Afghan envoys here warned. Both ambassadors called on the United States and its allies to provide more cash and military tools to defeat terrorism on the battlefield and alleviate the poverty and ignorance that sustains extremist ideology. Pakistani envoy Husain Haqqani welcomed the new Obama strategy, but contrasted the aid given to nations with the multi-billion-dollar bailouts extended to US companies in distress. “The resources that are being committed may look big to some but very frankly, I think that a company on the verge of failure is quite clearly able to get a bigger bailout than a nation that is accused of failure,” he said. Obama last month put Pakistan at the center of the fight against Al-Qaeda as part of a new strategy dispatching 4,000 more troops, in addition to an extra 17,000 already committed, and billions of dollars to the Afghan war. Afghan ambassador Said Jawad, speaking alongside Haqqani at a forum organized by Washington’s Atlantic Council think-tank, also said Obama’s new strategy marked a welcome reorganization of US goals. But he stressed that Afghanistan needed more help for a major expansion of its security forces, from the 134,000 army troops and 82,000 police personnel foreseen in the Obama plan. To counter the resurgent Taliban, he said, the Afghan army should number at least 250,000 and the police 150,000.